In the mean time, here’s a find I made yesterday. 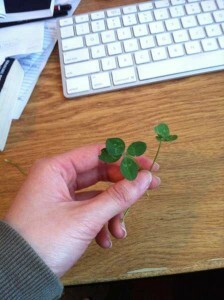 It’s been two years since I found my last four-leafed clover but on the way home yesterday I found two. And another two two-leaved clovers that appeared to be legitimately short one leaf. It feels good to get my average back on track.